This weekend my friend Fay from Bea and Rose was holding a trunk show at The Knit Studio in Newcastle. It's been ages since I've been to Newcastle (even though it's only about a half-hour drive from us), so I decided to take the opportunity for a little day trip. The plan to go to Newcastle was rather last minute, so by the time we got into the city it was almost lunchtime, but as I knew my daughter would only want to spend so long looking at yarn, we headed straight from the car park to The Knit Studio. I can now get to the shop easily, but the first few times it took a little hunting. The shop is housed in Blackfriers, a restored 13th Century friary in Newcastle city centre, and the easiest way to get there is to walk to The Gates entertainment complex and turn down the path directly to the left of the main entrance, then take the smaller path to the right. The shop is on the right hand side of the square of grass, and if the shop is open, there'll be knitted bunting saying 'OPEN' hanging outside. The Knit Studio is a lovely welcoming little yarn shop. It has sofas and large tables for their knitting group and workshops. The selection of yarn is interesting, and covers a wide range of weights and materials. They also stock a large selection of knitting accessories. 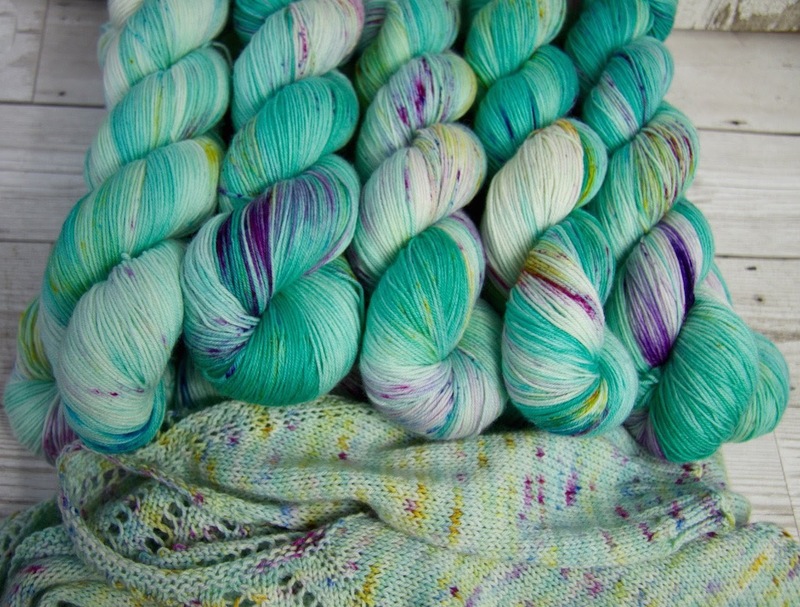 This time I was there to see Fay and her yarn, and was not disappointed. All of Fay's yarn was laid out beautifully on the large table in the centre of the room, and all of it was beautifully saturated. Fay also had some amazing project bags in fabrics woven in the UK and designed by Fay. 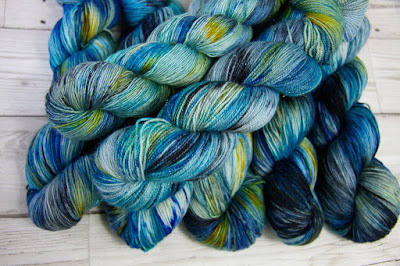 While there was no obligation to buy anything, I did come away with two purchases: a 100g skein of 4 ply merino/nylon in the colourway Juliette, which features purple splashes on a minty aqua background, and a sock blank in the colourway Whovian, inspired by Doctor Who and Van Gogh's Starry Night. Both yarns are rich and intense and I cannot wait to get them on the needles. Once we'd finished in The Knit Studio (I knew time was up when my daughter tried leaving! ), we headed to Waterstones' Cafe for lunch. I love the Newcastle branch of Waterstones (for those not in the UK, Waterstones is a branch of book shops), which is housed in the Art Nouveau Emerson Chambers building, built in 1903; while each floor is quite small there are four of them, with an ornamental spiral staircase running up the centre of the building. The bookshop has a very cosy feel, and all the staff are friendly and helpful. Our toasted tea cakes with jam were very welcome! After lunch we spent a little while in the children's department, me looking at the new releases and my daughter playing with the children's play table. I came across a brand new children's book called Izzy Gizmo, about a little girl who wants to be an inventor, and is everything I want in a children's book - a feisty girl who doesn't give up easily, and doesn't need rescuing, beautiful illustrations, and excellent writing (and yes, I have already requested it from a friend for my daughter for Christmas). Before we headed back to the slightly cold and damp autumnal day, I picked up a copy of Eleanor Oliphant is Completely Fine, which has been recommended by several people recently, so I'm excited to start reading that soon. All in all we had a lovely day out: yarn, food and books is always an excellent combination! Oh my gosh, the Starry Night yarn is stunning!